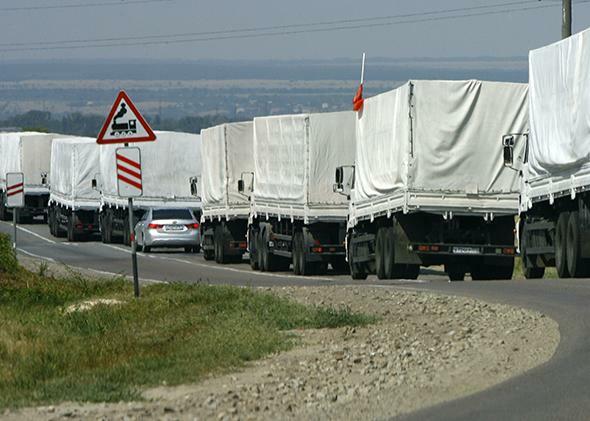 Russia Ukraine humanitarian convoys: Another chance for Putin to play the West for a fool. Trucks from a Russian “humanitarian convoy” arrive outside the town of Kamensk-Shakhtinsky in Russia’s Rostov region, near the Russian-Ukrainian border, on Aug. 14, 2014. Let’s be honest. We all know that the 280 giant white-draped trucks that have been zigzagging through the southwestern part of Russia for the last three days are not merely a benevolent gift that Russia is sending to the besieged people of eastern Ukraine: tons of grain, first-aid kits, baby food. Those of us in the West who write about the conflict, those who read about the conflict, and those who make policy relating to the conflict—we all know that this so-called humanitarian convoy is, at best, designed as an excuse for further Russian military intervention in Ukraine, and at worst is a Trojan horse, itself carrying military personnel and munitions. We know for a fact that Moscow has lied about having secured Kiev’s and the Red Cross’ cooperation and consent for the convoy. And yet we continue to go along with the charade, pretending to believe it may be all food, bandages, and good intentions until proved otherwise. This is the Putin military doctrine: He wins by lying. Western politicians and journalists and even media consumers, of course, also often lie—about wars, among other things—but these nonsystematic lies are child’s play compared with the art of lying as practiced by Putin’s Russia. Bald-faced lying is the one tactic Putin has used consistently through the six months of his Ukrainian incursion. It works every time, precisely because he and his Western counterparts are playing by different sets of rules: Every time, the West has to accept Putin’s version of events until it can be disproved beyond a reasonable doubt, and even then he gets to claim any area that remains gray. He got to annex Crimea before his assertion that the Russian military was not there was exposed as the lie it was. Because his claim that the Russian military is not in eastern Ukraine has not been definitively disproved, Western media and politicians continue to call the fighters “separatist rebels” or “pro-Russian” or “Russian-backed separatists.” We all know that these are armies formed and armed by Russian military and intelligence officers, but we know this the same way we know the “humanitarian convoy” is a lie: without being able to prove it. So the strongest term Western media or politicians have applied to these fighters is terrorists, which is not strong enough—calling these people terrorists defines them as nonstate actors. Nor is the suggestion that Russia should be labeled a state sponsor of terrorism strong enough. Russia is not sponsoring other people’s terrorism; it is waging an illegal war against a neighboring country. Here lies the chasm between the West’s and Putin’s assumptions. From the Western point of view, war is legal as long as the relevant conventions are observed. This concept makes it possible to help and protect civilians, to an extent, while war is going on, and to prosecute war criminals after it’s over. It also makes it possible to negotiate cease-fires and, eventually, peace settlements. From the Russian point of view, all is fair. The side that lies wins. If all is fair, you’d have to be an idiot not to lie. Idiots are whom Putin sees when he looks at the West. He keeps doing the same thing, and the West never learns: It still goes along with the lie for at least some time. Even in the open-and-shut case of the downing of Malaysia Airlines Flight 17, there were hours and days when Putin got to lie outright, and some doubt as to the particulars still lingers. And look at those idiots following a bunch of white trucks around Russia for days! Hell, these trucks could be empty for all they know, and they could snake along the border for months to come, and still the West wouldn’t be the wiser. What can Western media and politicians, and the Western public, do to avoid being played for fools every time? Nothing. As long as Side A admits no laws, rules, or morals and Side B attempts to observe them, Side A will win every round. But if Side B gives up on its principles, it will be truly defeated.